Every day I ask myself several questions – Am I satisfied with my day? Do I like my work? Did I enjoy doing it? And like me there are several thousands of people who ask similar questions. Some of them may feel good about it and some of them will always feel restless and uncomfortable about it. There could be several reasons for why one is not feeling good about what he or she is doing. The question is - Are we really passionate enough to do ‘that’ job for our living? Do we have that ‘element’ in us to be in the ‘zone’ or the ‘flow’? In his book The Element, Sir Ken Robinson tries to answer some of the critical questions quoted above. He defines the Element as the meeting point between the natural aptitude and personal passion. It is the place where things you love to do and the things that you are good at come together. Being in your ‘element’, keeps you in the zone, or in the flow. It is something that when you are in your element, the activity gives you energy all the time and it does not take away your energy. Like a painter who will never get tired of painting and who will always have energy to paint what he or she likes; Or like a musician who will always in the zone of creating amazing music. The next question that comes to my mind is that ‘Do I have that Element in me?’ or have I identified my element? Or why am I not pursuing my passion and instead doing some lousy job that I do not like to do? Which is my zone? Is it painting? Or is it fixing my bike? Or is it travelling? Or writing? Or teaching? Or is it photography? 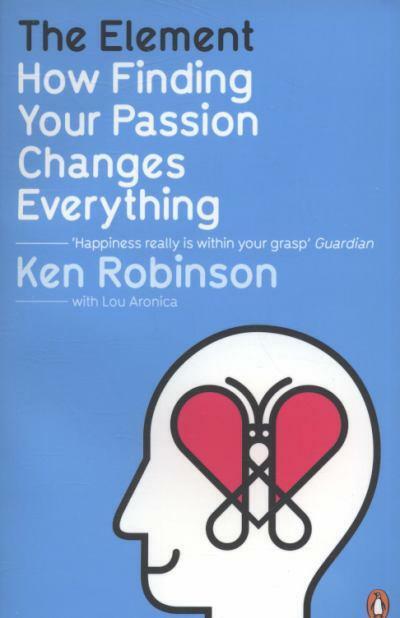 Sir Ken Robinson, like all others who have quoted extensively, tries to convey the same message that we are all born with some amazing talents and capacities, but as we grow older we will lose the touch without talents. The much quoted saying by Albert Einstein ‘I was born intelligent, education ruined me’ becomes very much alive. Sir Ken Robinson too, blames and rightly points out at our stringent education system. He says schools educate creativity out of us. When I started reading the book, it sounded more like Dr. Mihaly Csikszentmihalyi’s Flow – The Psychology of Optimal Experience. The chapter about ‘Being in the Zone’ talks very much about the book Flow. It was a great inspirational feeling while reading both these books. It challenges us to identify that element in us to keep ourselves happy in the zone. And it fights against the traditional education system that succeeded in limiting our knowledge and learning abilities. There are many inspiring stories in the book and every story has its message for you. Most the stories interestingly prove that in most of the cases education system never helped anyone reaching their element or finding their zone. For example Paul McCartney, Mick Fleetwood, Richard Branson, Matt Groening, Ewa Laurance and many more. The below story is one such eye opener. ...there was an eight-year-old girl named Gillian who couldn’t sit still in class. Today, they might say she had attention deficit hyperactivity disorder and give her Ritalin, Robinson says. A psychologist reached a different conclusion. Some of the stories are very shocking and quite challenging to believe. Like Paulo Coelho’s story of going against with the family was very revealing. His parents believed that he would waste his life on writing that they repeatedly placed him in a psychiatric institution where he underwent shock therapy. But he never gave up and he has become one of the inspiring writers across the world. Robinson says don’t ask how intelligent you are. The correct question he says to ask is: How are you intelligent? And one more problem the author identifies with the traditional education system is that it trains you on being always ‘right’. It will not prepare you for being wrong or taking risks or trying out something new, he says. Also some of the stories give the message that our age is no barrier to finding our element. Benjamin Franklin invented the bifocal lens when he was 78 years; so as Agatha Christie who wrote the world’s longest play when she was 68 years. The message for me here is that we will always have our talents in us for a very long time and it is up to us to recover them by constantly exercising upon them. Some days back I was thinking about an interesting idea of coming up with an initiative of for school children that makes them realize or identify their passion. Like a factory where children are exposed to different kinds of experiments and at the end of it they would identify what they really like. I was discussing the same with a friend and we were brainstorming very deeply on this topic. I feel this is what missing in our education system. They will never try to make an effort in helping children finding their talent. Instead they will fill them up with existing knowledge and limit them with their own knowledge boundary. One more chapter that moved me very much is ‘For love or money’ where the author discusses about the Amateurs. I was in the zone while reading it and almost did an assessment on me while reading the chapter. It makes one realize how important hobbies are and how exactly an amateur with respect to a certain skill can come up with some amazing stuff that even a professional cannot do? And there are several examples quoted that make you wonder how can there be a world without amateurs? Some of the stories included are of Arthur C. Clarke, Susan Hendrickson, Tiff Wood, Khaled Hosseini and some others. All of them are true amateurs and have achieved greater results being in their elements. This book is a very simulating read for everyone. Every one of us should read this book and get to know how identifying our element transforms our lives. Reading this book can also leave you depressed, if you have not identified your element or you are fed up of what you are doing and struggling hard to find what you like. But still, reading this may help you out answering some of your queries and gives a lot back to you through those inspiring stories. End of the day, if you are not in the zone, step back and ask yourself – They all have it in them to be in their zone, do I have it in me? Read some of the excerpts from the book The Element here. Link to the TED video of Sir Ken Robinson here. Your review is crisp and captivating. I completely agree with your opinion that our present education system is not conducive to uncover ones element or passion. Ideas in this book can revolutionize our education system. We need great teachers in great quantity. Hope Mr Azim Premji is on the right track is creating passionate teachers. First I read your excerpts sent by Sudhee , liked it. Got the book, I love it. Your detailed book review is helpful in giving an overview of the content. Your review may encourage me to read the book. At 71.5 I am encouraged by the stories of Franklin and Christie. Guess there is still some hope for me.